Here are some simple estimated survivability statistics of the population one year after the United States is hit with a high altitude nuclear electromagnetic pulse attack. At the end of the chart is the US Census for the year 1860. With all electronics wiped out and almost all electricity gone, life will be like the 1860's again. States with a lower population density may not lose as many people, but all of the above still apply. Even farmers are at risk. When people are hungry, they are only interested in the here and now. They have little concern for the future. Even though the farmer is the nation's best bet for long term survivability, hungry people will kill them simply for what they have in their kitchen pantry. Whenever you think about wanting to be prepared for a natural or man made disaster, preparing for an EMP whether it came from a HEMP attack or a massive solar flare is the best mindset you can have to best survive any potential situation. Why? Simple. All other disasters can be prepared for from a matter of minutes, like a tornado, to weeks or months in the case of a collapse of the dollar. It could take 10 years or more to recover from an EMP and it will happen in an instant and without warning. So, if you take a minute before you go to work, or on vacation, or travel on business, or whatever, think about what would happen if all electricity was gone in an instant. How would you eat or drink or survive? How would you get home? Get to your loved ones? How would you protect yourself and your family now and in the future from murderers, robbers, gangs and looters? If you can answer these questions in everything you do, you will be better prepared to handle anything that happens. "That nuts!" you say. If anything happens, the police and government will protect me. If you think this way, then you don't realize how fine the line of civilization is. The police are only an illusion of safety. First of all, even today an officer can only protect you if he can see or hear you. If he cannot physically see you or hear you scream, he can't help you. You are then on your own. Even with a telephone, they are probably too far to help you right now this instant. 90% of their work is after the assault, trying to find out who did it and try to bring them to justice (another illusion). In the average community there is only one police officer for every 600 people. There is no way an officer can physically protect all 600 people from murderers, robbers, gangs and looters. It's worse than that though. Here's an example: A small town of 60,000 has 100 officers to protect them. Only 34 of them are on duty though, because there are 3 shifts to cover. That's one officer per 1,765 people, plus all of the people that are visiting the town for whatever reason, good or bad. Here's another thing to think about. In whatever disaster, if the officer has a family, guess who he/she is going to want to protect? That would probably not be you. The right mindset could mean the difference between being the one that survived, or being one of the nine that died, and that death might not be pleasant. If you have the cash, hardening your home or installing an underground shelter makes an excellent life saving investment for you, your family, and generations to come. We can also help train you and your mind to operate quickly and decisively in reaction to disasters to protect you and your family from harm. Iran military endorses a nuclear EMP attack on the U.S.
Iranian Military Documents endorsed an HEMP attack scenario on the U.S. What you are about to read sounds like science fiction; it is not. It is a 21st century weapon we must deal with. This article has not been written to frighten anyone; but we should all be frightened because it would be worse than a million ‘Pearl Harbor’ attacks. The U.S. military command that scans North America’s skies for enemy missiles and aircraft plans to move its communications gear to a Cold War-era mountain bunker, officers said. The shift to the Cheyenne Mountain base in Colorado is designed to safeguard the command’s sensitive sensors and servers from a potential electromagnetic pulse (EMP) attack, military officers said. The Pentagon last week announced a $700 million contract with Raytheon Corporation to oversee the work for North American Aerospace Command (NORAD) and U.S. Northern Command. If the U.S. doesn’t destroy Iran’s ability to develop nuclear weapons civilization as we know it may be destroyed for hundreds of years. This is a frightening scenario but it can and may very well happen. Here’s why. If Iran were to explode a high altitude nuclear bomb above the U.S., an HEMP (high altitude electro magnetic pulse) would be set off and it is estimated up to 90 percent of the U.S. population would end up dying. This is not science fiction; it is a fact. Iran’s military documents describe such a scenario. What is nuclear HEMP? A nuclear device set off at high altitude would set off an electromagnetic pulse that would substantially damage or destroy the entire or most of America’s electric grid. The U.S. would be without electric for a year or more. This means we would have no electric, water service, sewer service, refrigeration, heat, communication, hospital service or anything else that requires electricity to operate. What would follow is starvation, chaos and anarchy on a level never before experienced by mankind. A knowledgeable source said that the textbook discusses an EMP attack on America in 20 different places. Arizona Republican Rep. Trent Franks, who is leading an effort to protect the U.S. electric grid from an EMP attack, has recently made similar claims based on the document translated by military authorities. Once sneered at by critics, recent moves by Iran and North Korea have given credibility to the potential EMP threat from an atmospheric nuclear explosion over the U.S.
Pry has suggested ways for Iran to deliver a nuclear attack: by ship launched off the East Coast, a missile or via satellite. Either way the result could be destruction of all or part of the U.S. electric grid, robbing the public of power, computers, water and communications for potentially a year. Iran armed with nuclear missiles poses an unprecedented threat to global civilization. 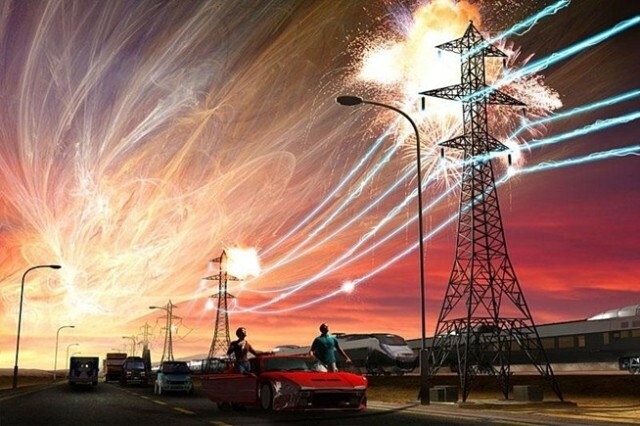 One nuclear warhead detonated at high-altitude over the United States would blackout the national electric grid and other life sustaining critical infrastructures for months or years by means of an electromagnetic pulse (EMP). A nationwide blackout lasting one year, according to the Congressional EMP Commission, could cause chaos and starvation that leaves 90 percent of Americans dead. Iranian military documents describe such a scenario–including a recently translated Iranian military textbook that endorses nuclear EMP attack against the United States. It is reported that Israel has protected much of its electric grid and if attacked by an HEMP it could restore electric within a few days. It has also set up a variety of defenses as well. If Israel can do it, why can’t we. To protect America there are two things that should be a top security issue that Congress must address without delay. First Iran should not be allowed to develop nuclear weapons or become a threshold nuclear State. Second Congress must quickly pass legislation and funding to ‘harden’ America’s electric grid against an HEMP attack. A nuclear attack can kill thousands; but and HEMP attack could kill millions.